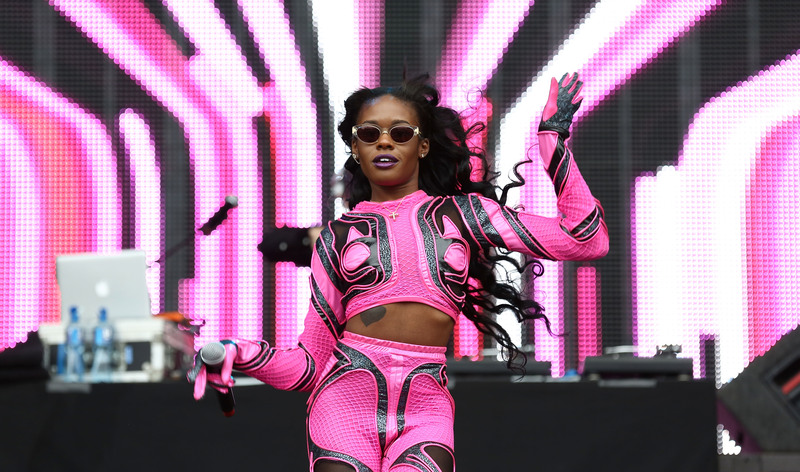 Azealia Banks was very, very angry on Thursday — and I don't blame her. The rapper took to Twitter to express her disgust at the utter injustice that the white cop who choked Eric Garner to death on the streets of Staten Island (on camera) was not indicted. However, when Azealia Banks brought up Bill Cosby and included him in the conversation, she lost me. After a series of impassioned tweets on Wednesday night, mostly directed at Iggy Azalea for her lack of response to the Garner case, Banks continued Thursday, talking about how white Americans are still threatened by a black president: "A black man in office is SCARY to white folk, and they will try and do ANY AND EVERYTHING to remind us that they are in control." Honestly, I commend Banks for expressing rage over the racial injustices that are being ignited in this country right now. I wish that more celebrities would express their beliefs when it comes to big issues like this. Where she lost me was when she turned the conversation to Bill Cosby... and came out in support of him. There's a huge part of me that wants to stand in solidarity with Banks and laud her for speaking angrily about racial injustice, but I don't understand why she has to tear down other victims. Banks tweeted: "from police murders, to macklemore and igloo australia.... They are even trying to tear down our father figure BILL COSBY," and went on to say, "them b--ches frontin' like they wasn't trying to get some of that pudding pop!!!!" It's pretty ugly language that devalues and minimizes the countless victims who have come out, bravely, to share their stories of abuse at the hands of the comedian throughout his career. I understand (and share) Banks' rage about the ignorance and blindness of the system that has the blood of Eric Garner and so many others on its hands, but I do NOT think that this same system is responsible for besmirching the name of Bill Cosby. Personally, I have to believe the many, many women who are accusing Cosby of heinous crimes, not only because their stories are all so similar, but because I believe that I must believe victims, because they take such a risk speaking up and having a voice. I so wish that Banks had not grouped in the claims against Bill Cosby into her opinions on Garner and ignored the very real pains of so many women. I think above all I am so disappointed by her vulgar insensitivity (the pudding pop comment is just unreal) because I wish more celebrities expressed their utter rage about injustice. Understandably, celebrities try to remain even-keeled and palatable, and I get that — there is a balance to being famous. It is a job. But sometimes it feels good to see celebrities express more visceral feelings in the name of activism. That's why I don't know how to feel about Azealia's comments on Cosby. I don't want to have to totally reject her earlier, valid statements about race, but I cannot support her defense of Bill Cosby. It's a conflict I often deal with: what do you do when your faves are problematic? I'll let you know when (if) I figure it out. For now, I'm gonna have to pass on Banks.